Hope runs deep. You and a guest are invited to the special advance screening of the incredible true story, The 33, being held on Tuesday, November 10 at 7PM in Salt Lake City. Click here to download your admit-two pass now! (While supplies last. Passes admit up to two (2) and do not guarantee admission, as the theater is overbooked to ensure that it fills. Arrive early for ticket exchange process.) Good luck and we’ll see you there! In 2010, the eyes of the world turned to Chile, where 33 miners had been buried alive by the catastrophic explosion and collapse of a 100-year-old gold and copper mine. Over the next 69 days, an international team worked night and day in a desperate attempt to rescue the trapped men as their families and friends, as well as millions of people globally, waited and watched anxiously for any sign of hope. But 200 stories beneath the surface, in the suffocating heat and with tensions rising, provisions—and time—were quickly running out. A story of resilience, personal transformation and triumph of the human spirit, the film takes us to the Earth’s darkest depths, revealing the psyches of the men trapped in the mine, and depicting the courage of both the miners and their families who refused to give up. 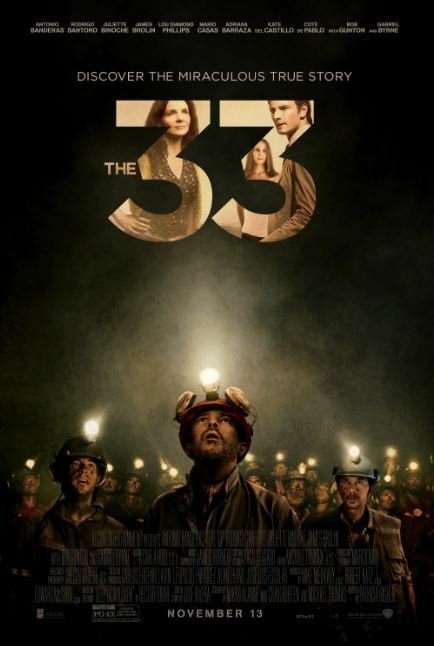 Based on the gripping true story of survival — and filmed with the cooperation of the miners, their families and their rescuers — The 33 reveals the never-before-seen actual events that unfolded, above and below ground, which became nothing less than a worldwide phenomenon. The 33 opens in theaters November 13!